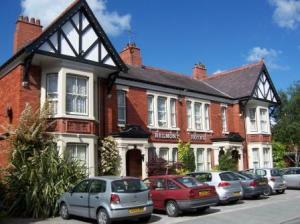 Choose from 6 hotels and guest houses in Wrexham. Shown below a just a selection of the hotels available. To search within an area please use the menu on the right. This hotel has air-conditioned bedrooms and excellent conference facilities for up to 220. It is south of Chester and close to major road networks leading to Chester, Manchester and Liverpool. 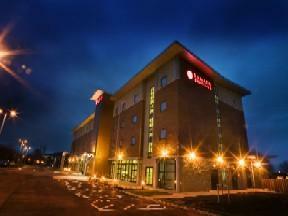 Ramada Plaza Wrexham is close to Vale of LLangollen and only minutes away from the hospital and industrial estate. Relax in the Health and Fitness Suite, unwind in the comfortable and stylish Fusilier Lounge Bar or dine in Zara Restaurant. 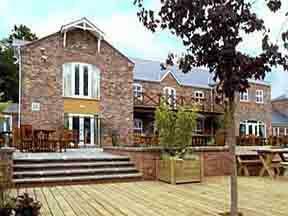 With its mellow bricks and beautiful walled garden, Lion Quays looks as if it has been beside the Llangollen Canal for centuries, surrounded by the rolling countryside on the border of Shropshire and Wales. In fact this is a 21st century, purpose-built development. Here you will find a superb 82 bedroom hotel, the welcoming Waterside Bar and Restaurant, with its views of canal life and the 20 moorings, which have been created for the many narrowboats travelling along the Llangollen Canal. In summer you can eat outside, soaking up the sun on the terrace. Our aim has been to create a unique venue where quality is a priority, at a price that won't break the bank. Moreton Park Lodge is a family-friendly motel. A restaurant, garden centre and Billy Badgers Play Den are part of the same complex. Moreton Park Lodge has easy access to Chester, Wrexham, Llangollen, Telford, Shrewsbury and Oswestry. Rates do not include full English breakfast, but discounted breakfast rates are offered if booked at the time of reservation. Breakfast is served in Lord Moreton Restaurant, which is adjacent to the motel and accessible via a covered walkway. 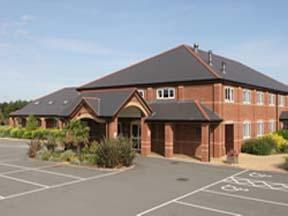 Guests have free use of the facilities at Lion Quays Country Club whilst staying at Moreton Park Lodge. Some of these facilities include a 25-metre mood-lit swimming pool, a star-lit steam room, a sauna, and gym facilities. This relaxed, friendly country-house hotel is set in 6.5 acres of beautiful mature gardens. It is ideally located for Llangollen, Wrexham, Chester, Erddig Hall and Chirk Castle. Cross Lanes has en suite rooms with free Wi-Fi, and is ideal for visiting the spectacular Welsh hills and castles and gardens of North Wales and Chester. First-class golf and fishing are close by. The Lanes Bar and Restaurant has a relaxed, informal atmosphere and serves freshly cooked dishes created with locally sourced ingredients whenever possible. It has held an AA Rosette for 12 consecutive years. Belmont Hotel is walking distance from the town centre and not far from National Trust Erddig Hall and Park. It has en suite rooms with free wireless internet, and free parking. The spacious town-house hotel is a practical base in Wrexham, North Wales and is within walking distance of the train station.